The Fuji Electric Time Delta-C ultrasonic flow meter is the latest generation of high performance ultrasonic flow meters using transit-time technology. 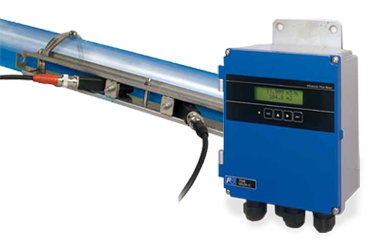 As it is a non-invasive clamp-on ultrasonic flow meter, the Time Delta-C ultrasonic flow meter is the perfect option for measuring flow rates of relatively clean, homogeneous liquids in closed, filled pipes. The Time Delta-C ultrasonic flow meter is particularly effective in applications where high accuracy is required and the flow meter needs to be installed without shutting down the process. The Time Delta-C ultrasonic flow meter uses advanced digital signal processing technology to provide a compact, lightweight solution with accuracies that are better than +/-1% of flow rate with minimal influence by the pressure or temperature of the measured fluid. The Time Delta-C offers best in-class anti-bubble performance, which allows for accurate reading with air bubble content as high as 12% volume at 3 ft/s velocity. IP66 (NEMA 4X) protection makes it ideal for installation in internal and external environments. Push buttons on the front panel make configuration of the Time Delta-C, simple and intuitive. Multiple configurations can also be downloaded from a PC to the Time Delta-C ultrasonic flow meter. Real-time trending and data-logging as well as diagnostics can be performed with the loader software. The software also includes a Sensor Spacing Calculation tool. Flow rates and totals can be transmitted from the Time Delta-C to any other device thru a selection of outputs which include 4-20 mA, Relay, Transistor outputs, RS-232 and RS-485 (MODBUS). The Time Delta-C ultrasonic flow meter requires clamp-on sensors (detector unit). These sensors clamp to the outside of pipes and cover pipe diameters from 13 to 6000 mm at liquid temperatures from -40 to 200 deg C. The system requires a straight pipe run of 10x and 5x pipe diameters for up-stream and down-stream respectively. Transit time ultrasonic flow meters are well-suited for relatively clean fluids with low to moderate aeration. These meters operate by comparing the time for an ultrasonic signal to travel with the flow (downstream) against the time for an ultrasonic signal to travel against the flow (upstream). The difference between these transit times is proportional to the flow, and the flow meter converts this information to flow rate and total. With this technology, the transducers are mounted on the outside of the pipe, providing tremendous advantages over more traditional and invasive flow measurement instruments such as magmeters, vortex meters, and turbine flow meters. These benefits include no system downtime for installation, no system contamination, no pressure drop, no moving parts and no risk of leaks. The Portaflow-C is virtually maintenance free.